I'm firmly on record as loving My Dying Bride the most out of the "Peaceville Three", just getting them in a way that I've never quite achieved with Paradise Lost, who I certainly enjoy and appreciate for different reasons; often having a better grasp of hooks and melody, for one thing. Like My Dying Bride, and indeed Anathema, they're a band that metalheads either love or near-contemptuously disregard, with little between. 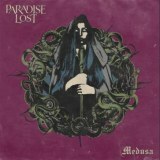 Everyone will have their favourites, and although My Dying Bride still top the list for me there's no denying that I was seriously impressed with Medusa, Paradise Lost's fifteenth album. They may have strayed with the Depeche Mode-y pop influences of One Second et al, but since 2005's self-titled album Paradise Lost have started a return to doom-death quality culminating in 2015's excellent The Plague Within, which saw the band more or less back to their deep, dark origins. With death metal side-projects like Vallenfyre and Bloodbath to influence them, Paradise Lost left pop behind a long time ago, and they're all the better for it. Even on initial listens to Medusa, it's clear that with better songwriting and a more refined sense of atmosphere, this is the best-written Paradise Lost material in a long time. The eight-minute-plus Fearless Sky kicks things off with ominous keyboards leading to funereal doom metal, Nick Holmes' dry growls setting a death metal scene atop backing mournful guitars, an overall effect that would be equally effective were he singing. Throughout Medusa, the clean vocals are kept back and only used where they'll be most effective, carefully spaced and free of any pop influence. Doom really is the word; Fearless Skies' later uptempo boost is prime Sabbath and catchy as much because of the change in style as anything. The song flies by, not feeling nearly as long as it actually is, setting a high standard that the album keeps matching. Gods of Ancient opens with an old-school battering before slowing the pace and allowing Holmes's growl to ride atop the doom-death groove, a groove given space to expand on following tracks, From The Gallows and The Longest Winter especially. That latter track feels the most like my expectations of Paradise Lost so far, albeit with a drive and emotional foundation perhaps lacking in the past. Medusa keeps improving as it continues. Piano backing and clean singing in the title track help push it back a little towards gothic metal territory, with a lengthy instrumental section helping it stand out even more. No Passage for the Devil adds considerable old-school groove to the mix before perhaps the most instantaneous track on the album kicks in, Blood and Chaos seeming relatively catchy when compared to its surrounding tracks. It's closer to past albums even with the growls which could just as easily be sung vocals for equal impact, the infectious chorus and melodic hooks carrying all. And while the slowed-down melodic death of Until the Grave makes for a good finale, bonus track Symbolic Virtue is even better - the b-side from the single release of Blood and Chaos, a greater reliance on hooks makes for a more memorable closer in a song that really could and should have made the main album tracklisting. There are criticisms to be made here, of course; the lack of variety making this a tough listen unless you love the style, and perhaps the production highlights the rhythm section a little too much in places, which muffles the guitars. It's definitely not an instantaneous listen either, making you work to uncover the hooks and melodies that once would have been the main focus of the songwriting. Yet by no means is this a bad thing, as it results in an album that rewards repeated listens and will give those that know the band an especial thrill as it slowly releases its secrets. A real grower, Medusa is a solid argument in Paradise Lost's favour and an album that any doom-death fan should give their time.